I'm trying to get in the habit of sharing my Ipsy bags more often! I thought I should share some swatches and how I feel about my June glam bag before June is over! June's theme is On the Wild Side. The makeup bag is definitely wild with leopard print and neon yellow, but I love it. The items themselves aren't too wild, though they're still somewhat outside my comfort zone, so they're wild enough for me. But that's why I love Ipsy - it gets me to try new things! The Cailyn gel liner is one item that I was really hoping to get, specifically in purple. I've tried quite a few black gel liners, and I'm still getting used to them as opposed to liquid liner or pencils. They're surprisingly easy to get the hang of though! I think it's easier to apply than liquid for the top lid, but that's just my preference. I really wanted to try the purple one since it seemed fun and different. The color is nice since it's a pretty deep purple - I thought it would be much brighter at first. It's a nice change from basic black though without being boring brown. The container it comes in is interesting since the pot of gel liner and mini brush come together. It's quite handy! The brush is actually nice quality and made it easy to apply the liner. In the photo below, I used the wide side of the brush and on the right I used the narrow side. You would most likely use the narrow side since it's a liner, but the brush holds quite a bit if you wanted to do a really thick line or just apply it like shadow. 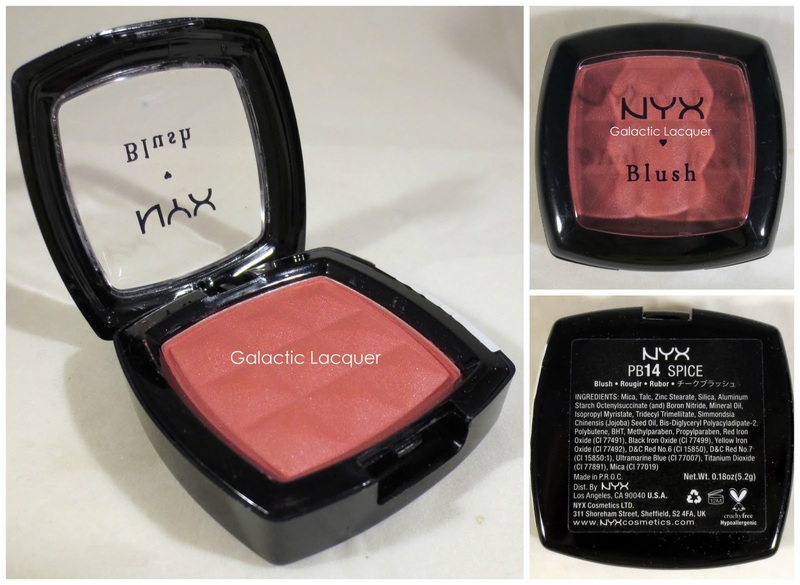 The NYX blush is a great product, but was a little of a letdown for me specifically. The blush itself is amazing, but the color just isn't really for me. The blush feels super silky and smooth to the touch, and it actually blends very nicely and effortlessly. The color is just a little bright for me! I received Spice which is a pretty bright pink. It would probably work well on a lot of people, but I'm just about porcelain white, so even applying it as light as possible and trying to blend it just makes me have pretty rosy cheeks! The texture of the product and application is great though, so I may have to explore this blush in a different shade. It's a little disappointing that I was paired with this shade though since I was hoping Ipsy would start giving subscribers products based on their skintone. This palette was probably the biggest letdown in the bag. I was hoping for a shimmery or glittery eyeshadow palette, but this isn't really eyeshadow. The J.Cat website actually says "This product should be used with caution and attentive application around the eye area and on the body." That doesn't mean you can't use it as eyeshadow, just be careful with it. Personally, the pieces of glitter are a little large for the eye area, and I would be afraid of getting some in my eye, but I went ahead and tried a little anyway. The glitters are in a clear base, so there really isn't any color to them themselves. I swatched them on my hand below, and you can see that the glitter covers very well with a quick swipe from each color, but there is no base color. I was using the bluish one all the way to the right over some purple shadow and it looked pretty nice. I just very lightly dabbed the glitter with my finger and then dabbed it onto my lid. It added a nice pop of sparkle without going overboard. A little goes a long way with it, which is good since the palette isn't very deep and there isn't much of each color! I was hoping to receive one of the other possible colors of this product in my bag, but I guess I can't complain! 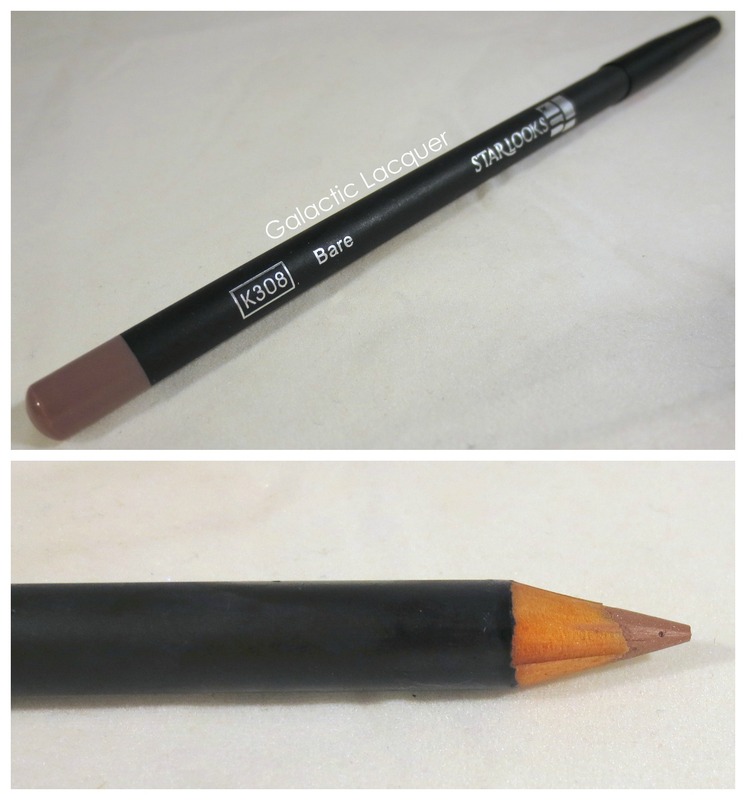 This lip pencil is called Bare and is a very neutral color. It's almost a beige brown at first glance, but looks pretty brown when swatched on my hand. On my lips however, it looks almost grayish purple! I really don't think I'll be wearing it as an all-over color with my skintone. I might use it as a base for another color though. It applied great though, so like the NYX blush, I may have to look into other colors. I have some NYX lip pencils that are pretty stiff, but this one is much softer. It applied very easily and the product is very soft and smooth. It's easy to be precise with, but glides on easily enough for all-over color. 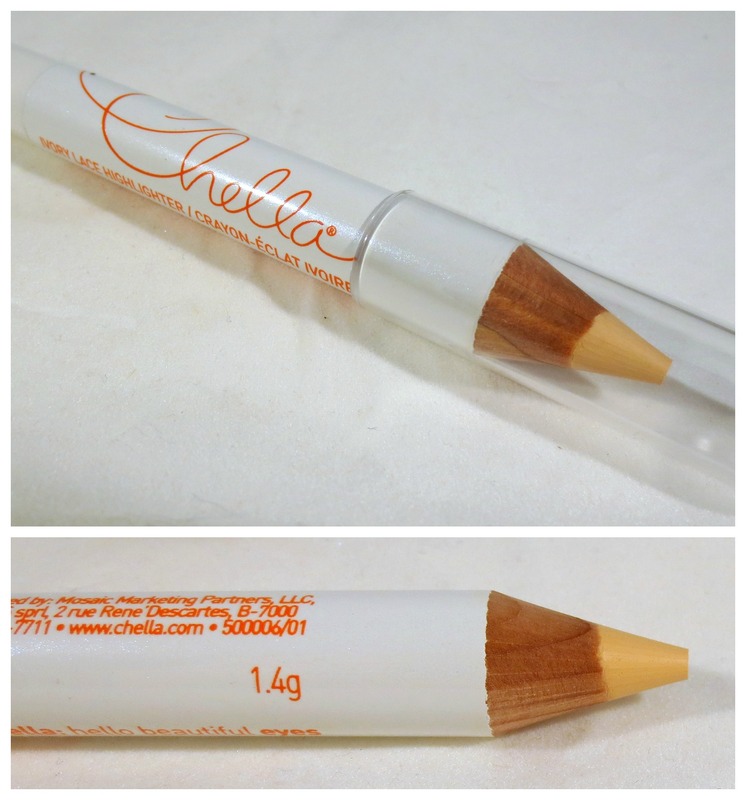 The Chella highlighter crayon is something sort of new to me. I don't highlight or contour often, so I don't typically use too many products like this. I tried it on areas of my face such as down my nose and on my brow bone. It definitely highlighted the areas and blended in nicely! In crayon form it's really effortless to use, so it might get me to try highlighting more often. I really only highlight my brow bone on a daily basis, so it will probably get used for that most. It's easy to be precise with too, so you can carefully line under your eyebrow to really make it pop too. As you know, I'm pretty porcelain in skin tone, and this Ivory Lace pencil is light enough to highlight on me. Not by much, but it still helps. It would definitely make a difference on darker skin tones though! Once again, I'm pretty happy with my bag. I can't complain about too much since it's still only $10 a month, and as usual, I ended up with products that I know I will use that are worth more than $10 on their own. I also just love trying new products for an affordable price. I would have other beauty subscriptions if they weren't so expensive, but Ipsy fits my budget! I think I'm loving the Cailyn gel liner the most, but I'll be trying to make the other products work more as well. I got to try out a few of Rainbow Honey's new polishes about a week ago. I had posted about The Kracken, Pink Cloud, and Tiny Ruby that I was sent for review. Well I loved them so much that I bought the entire set! I absolutely love Rainbow Honey's polishes, and I knew I had to have this collection. The entire Summer of 199X collection consists of 10 polishes, but I'm only going to show you three more that I combined for a bright, colorful manicure. I used Mint Flavor, Tessie, and Magic Cake, all from Part II of the Summer of 199X collection. Mint Flavor is a beautiful minty light blue creme. It has some slight shimmer to it, but it's mostly a creme. Tessie is a light purple creme that also has some shimmer, though I find the shimmer to be a little more apparent in this one than Mint Flavor. 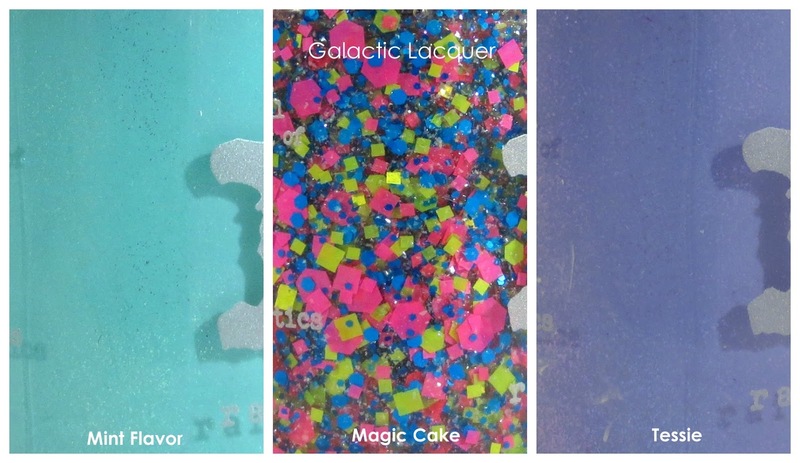 Magic Cake is a colorful glitter topper. It is a clear base with lots of matte hot pink, blue, and green glitters. There are large hexes, medium squares, and some smaller hexes. There is also a bit of sparkle to the base. I'm really loving the matte and satin glitters! I applied two coats of Mint Flavor on all my nails except for the accent nail, which I used two coats of Tessie on. Both colors applied smoothly and left no streaks. They covered very well for being pretty pastel. I then applied one coat of Magic Cake on each nail. It covered well, though it may seem a little sparse to some people. I didn't want to add a second coat and make it overwhelming looking, but it would be pretty easy to build up. I love how well they actually go together! 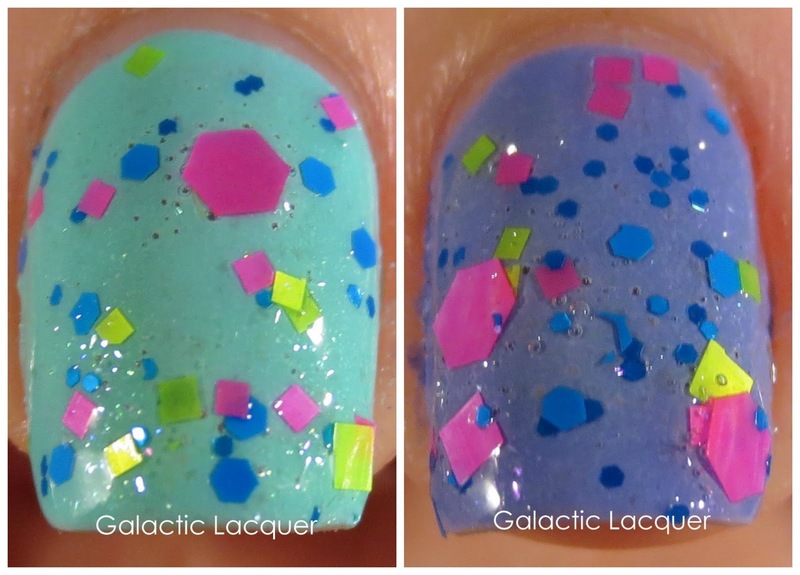 It's very bright and summery, and the more matte glitters look almost like neon paint splatters. I'm enjoying how different this looks from most polishes and glitters I've been wearing and seeing recently. You can purchase the entire collection from Rainbow Honey in either full (15mL) or mini (3.75mL) sizes. 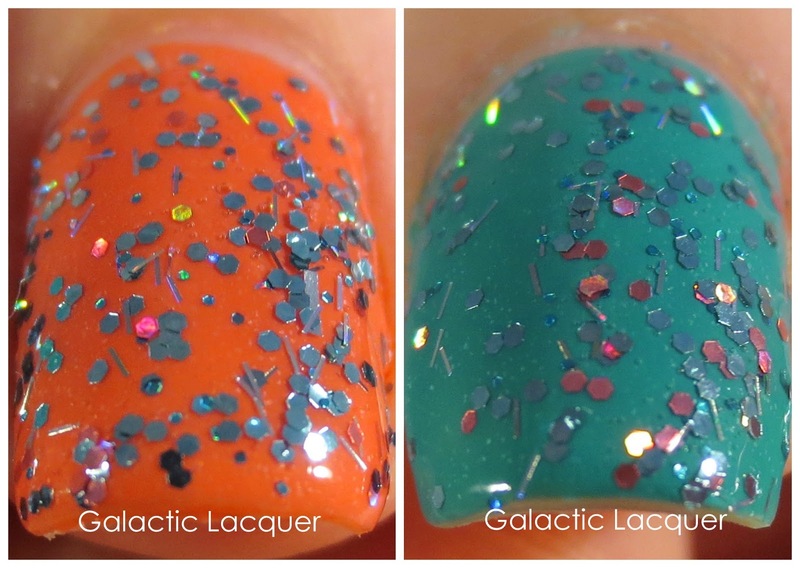 Or you can buy Part I, Part II (which has these three polishes), or even individual colors now! 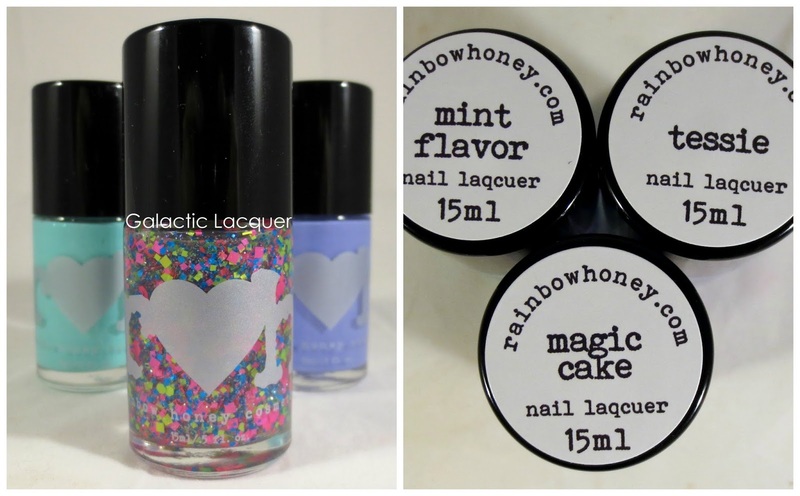 Don't forget that if you spend $50 on rainbowhoney.com you also get this month's limited edition polish (which is Mt. Moon this month) for free, along with free shipping! I'm excited to share my first experience with I Love Nail Polish! A friend gave me my first ILNP polishes for my birthday, and this is one of them. It's a mini glitter topper called Little Mermaid. 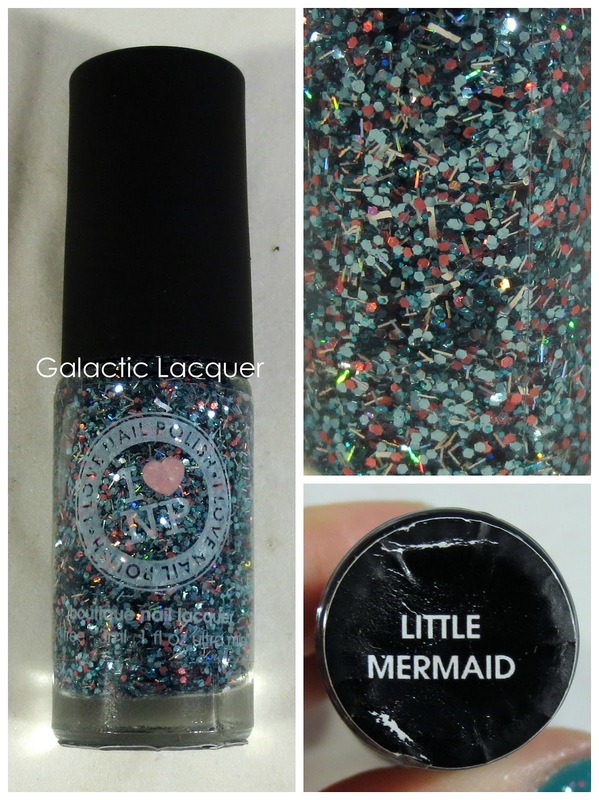 Little Mermaid is a clear base filled with glitter. It's mostly seagreen almost pale blue hexes along with some pinkish coral hexes. There are also some holographic hexes and super tiny bar glitter. I've never seen bar glitter this tiny before! 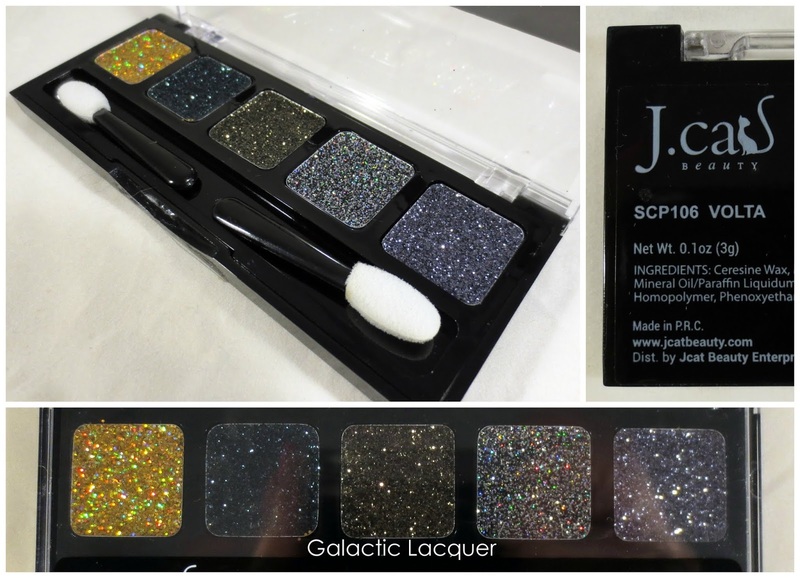 I'm not a big fan of larger bar glitter, but these are great. I couldn't decide on a single color to put Little Mermaid over, so I applied it over two! I used Essie Naughty Nautical (teal) and Essie Sunday Funday (coral), both from Essie's 2013 summer collection. Both have a very slight shimmer, but they're so close to cremes that I thought they'd be great with glitter on top. I'm really loving the summery colors, and knowing the nautical theme of all three polishes involved really makes it feel extra "beachy" and summery to me. I think the teal is a little dark to show some of the glitter though, so maybe I'll try it over a lighter mint and coral next. Application was great, and it really only took one coat of Little Mermaid on each nail. I went back and filled in a couple spots that were a little sparse, but the entire nail didn't need a whole second coat. I think the glitter distributed really well in one coat, and depending on how generous you are with that coat, you may not even need to go back and fill in a couple gaps like I did! I tend to apply thin coats of polish. An "ultra mini" bottle like the one I have is only $3.75! They also have 12mL full size bottles for $10 each. I Love Nail Polish also has an Etsy shop if you'd prefer to buy from there. 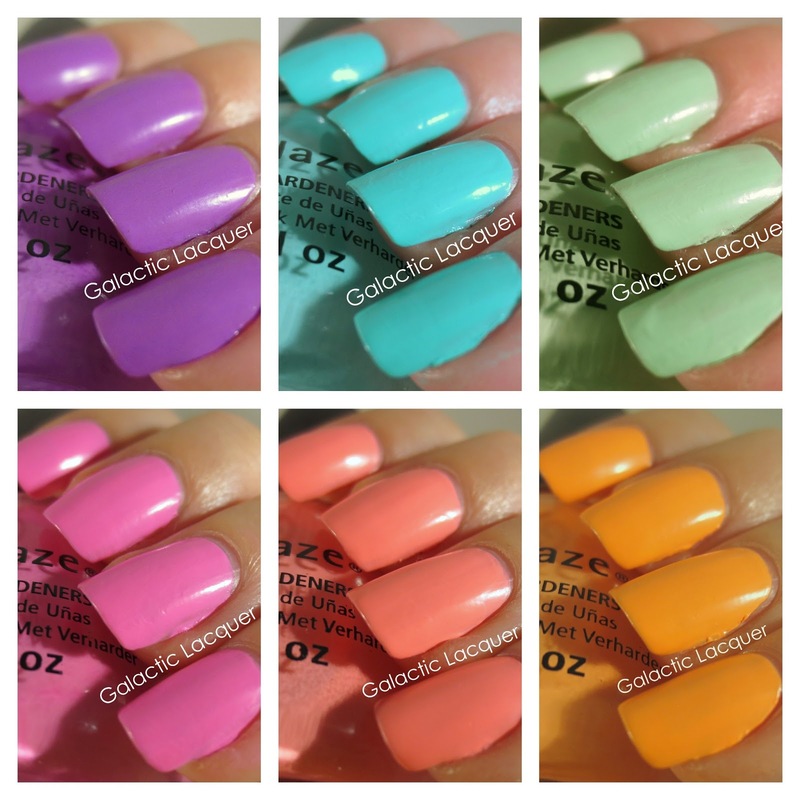 I reviewed the China Glaze Sunsational jellies last week, so now I have the cremes! These ones are more neon than the jellies, and I am in love with the color selection. Neons are very difficult to photograph though, but I did my best to try and make the polishes look true to color since that's the important part. So my skin tone might look a bit off in some! I ordered this set on Amazon, and I was excited to see that it was in the actual packaging! The jelly set I bought was just six loose polishes. I'm really happy that I ordered them since they're really stunning in person. Really, I haven't seen any photos that truly portray the shades accurately - you just have to see them in person! I also did not apply topcoat like I normally would. Since they are neon and dry somewhat matte, I wanted to show how each polish looked on its own. That's Shore Bright is a beautiful warm purple shade. This one is very unique to my collection as it is bright like a neon, but not the typical neon purple/fuchsia that most brands make. It's almost like a neon-pastel hybrid! Most in this collection are, so they're light but very bright. They all almost glow like day-glow colors. I applied two coats of That's Shore Bright with no topcoat. It covered very well for how light it is, and left almost no streaks. A topcoat would eliminate any remaining streaks, but without a topcoat you can see that it is somewhat matte and not glossy. Too Yacht to Handle is a gorgeous blue. This one is a little lighter in person, though it is still very bright! It's not really a neon pastel baby blue, it also has a hint of greenish to it in person. It made me think of a lighter, brighter version of For Audrey. I applied two coats of Too Yacht to Handle with no topcoat. This one left a few lines, but it wasn't really streaky. It applied nicely, but didn't dry as matte as That's Shore Bright. Highlight of My Summer is one of those polishes that I knew I would like immediately. It's not so much of a neon mint as it's a neon spring green. It definitely has more yellow undertones to it than mint, and this one glows in the right light! Not literally glow-in-the-dark, but it looks super bright even in the shade. I applied two coats of Highlight of My Summer with no topcoat, though I should have probably used three. You can see that it is a little streaky and left some lines, but nothing too serious. Another coat of polish or some topcoat would probably sort it out. Coverage was great though, and I like how it dried pretty matte too. Bottoms Up is a pretty standard bright Barbie pink. It's a neon pink with cool undertones, so it's really pretty, I just sort of feel like this color has been done a lot before. Coverage was great as I applied two coats of Bottoms Up with no topcoat. There are some thinner spots, so again a third coat may have been necessary, but I suppose that depends on how thick you apply the first two coats. I don't think I was generous enough with the first coat, but now I know! Bottoms Up also dried pretty matte. Neon & On & On is a gorgeous shade. It's somewhat of a neon pink that leans coral. I'm loving this one a lot more than Bottoms Up, but it's all personal preference! Both applied pretty much the same and covered well. I applied three coats of Neon & On & On with no topcoat. This one wasn't really streaky, I just had the same user error as Bottoms Up - some spots looked a little thin in two coats since I wasn't generous enough with the first coat. Three seemed like overkill at first, but it did make it look much nicer, so it was worth it. Sun of a Peach is a polish that I just can't do justice with my camera. It is not this bright of an orange, and any amount of editing and playing with camera settings just couldn't get it to look correct. It's not this bright, the photos just make it look more like Sun Worshipper or Papaya Punch. It is definitely more of a pastel neon peach, so it is lighter and brighter, and more pale orange/coral than orange/yellow. I apologize for it not being color accurate - it really bothers me that it isn't since I love this color! I applied three coats of Sun of a Peach with no topcoat. It covered great and evened out nicely. I didn't get any streaks, and I'm loving the slight matte finish. Bottom line: I would recommend this entire set! I love how unique the colors are since they're somewhat pastel and neon hybrids. Also application was great for me. I think the key is to just apply each coat and not play around with it too much - it's easy to overwork cremes and then you get streaks and thin spots. If it looks thin, don't worry about it and just get it in another coat instead of trying to make the coat you're working on absolutely perfect. I think two or three coats are perfect depending on the color, and they look great with or without topcoat. I didn't feel up to swatching all of the China Glaze Sunsational cremes today, so I just did one polish. But this polish is really exciting on its own! This one is Femme Fatale Cosmetics Nightsong Grotto. I just received this one in the mail a couple days ago from Llarowe. Nightsong Grotto is really incredible. It's a deep bluish teal jelly base that is packed with glitter. There are green holographic hexes, tiny red holographic hexes, blue circles, and some large circles and hexes too. It's also crazy to think that this polish is all the way from Australia! Femme Fatale Cosmetics doesn't ship outside of Australia, so I bought Nightsong Grotto from Llarowe when they released this color on their site. 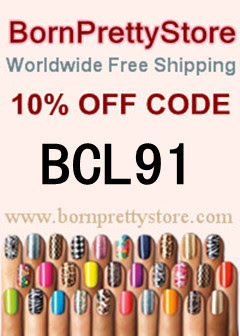 I like how the label even says "3-free nail lacquer. Proudly Australian owned." I used two coats of Nightsong Grotto for these photos. As you can see, the blue jelly base builds up very easily. It was pretty thin and light in one coat, but two really deepened it. There is also so much glitter in this polish that it was almost annoying! I say "almost" because it applied alright, and how can you be upset that there is so much glitter?! I think the reddish flecks really add to this polish. The depth is incredible since it's a jelly, and I'm seriously overwhelmed by all of the glitter. It looks fantastic, and even though the glitter is mostly green, blue, and red, the holographic glitters shine anywhere from purple to orange too. The contrast in the Vine video is a little off and makes the polish look super dark. It's still a pretty dark bluish teal in person, but it's not as navy as the video makes it look. The contrast on my iPad's camera is just not as great as my real camera! It sells for $13, so it's a bit pricey considering it's also 12mL instead of the more typical 15mL. But it's really an incredible polish, so grab it next time Llarowe restocks if you want it! I'm going strong on my swatching spree! Today I have the Naughty Nautical collection from Essie. This is their summer 2013 collection. I finally bought them from Amazon and wow, they are so pretty in person! 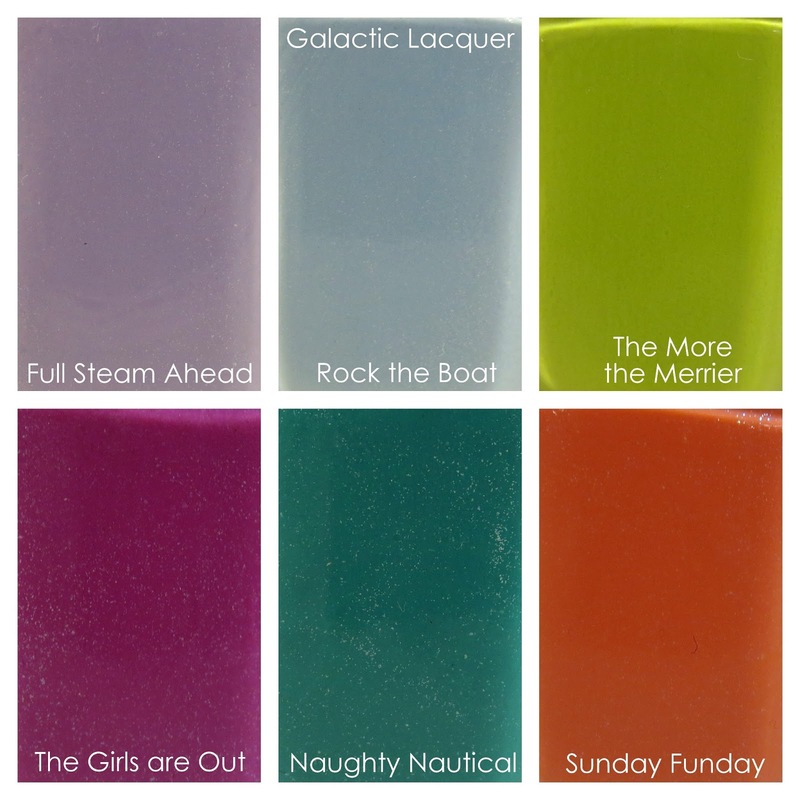 There are six polishes in this collection: Sunday Funday, The Girls are Out, Full Steam Ahead, Rock the Boat, The More the Merrier, and Naughty Nautical. The colors are very bright for summer, although a couple are a bit more pastel. All of them are slightly shimmery except for The More the Merrier, which is a creme. You can see of the silvery shimmer in the closeups below. Full Steam Ahead is a really pretty purple shade. The Naughty Nautical collection as a whole looks pretty summery, but this polish alone looks more like a spring shade to me. Full Steam Ahead is pretty light but still covers well. I used two coats for these photos, however there are a couple spots that look thin. A third coat might have been necessary! Still, it applied very nicely. The first coat was pretty thin and streaky, but the second coat fixed it right up. Rock the Boat is another polish that doesn't really scream "summer" to me, but it's gorgeous nonetheless. This one reminds me of Sinful Colors Cinderella since it's a shimmery pale blue, but I don't think Rock the Boat is as shimmery. I actually sort of prefer this one since the shimmer is there, just subtle. Then again, I'm a huge fan of cremes! Like Full Steam Ahead, Rock the Boat covered well in two coats, but probably could have used a third just because it's such a light color. The first coat was a little thin and streaky, but the second coat really made it opaque. The Girls are Out is a wonderful fuchsia color. I really like this shade as it's a little different from the typical neon pinks and purples - it's almost somewhere in between. It's a little more on the purple side than the pink side, but this color is pretty difficult to photograph perfectly. I used two coats of The Girls are Out. Being a little darker in color, it covered very well. I don't think a third coat is needed at all for this polish. It applied great and evened itself out well so there were no streaks. The More the Merrier is an interesting shade. It's a little more yellow-green in person, as this is another difficult polish to photograph (a lot of neons are!). I would describe this one as almost a lime green or a chartreuse. It's also a shade that I know people tend to either love or hate! Even though it looks like Nickelodeon slime green in the photos, I'm liking the color. It's very bright on its own, but it'll be great for some summer nail art! I applied two coats of The More the Merrier and had no problems with application. I am impressed that it is pretty much a streak-free neon creme! Again, this one also has no shimmer, while the other five in the collection do. Naughty Nautical is easily one of my favorites from this collection. It is a bright teal shade that leans more blue than green. With how light it is, I suppose you could also call it turquoise. I used two coats of Naughty Nautical as well, though three may have been better for this one. Both coats covered well, but some spots just seem a little thin. Sunday Funday is probably my second favorite from this collection. I am a sucker for teals and corals, so this and Naughty Nautical really grabbed my attention. Sunday Funday is also a little difficult to photograph, but it's a coral that leans more pink than orange. My camera, even with adjusting, just wanted to make it look more orange! I used two coats of Sunday Funday. Application was great and it covered well. I don't think this one really needs a third coat, but it might if you really want to make sure there are no thin spots, just like Naughty Nautical. I'm really happy that I bought this collection while it's easy to find. The colors are really bright and interesting to me, and while I own some similar shades already, these ones still remain unique with their subtle shimmer. I also like how bright and cheery they are without being full-on neons. And application was pretty good - most look great with two coats!